With a stay at Hotel Contessa - Luxury Suites on the Riverwalk, you'll be centrally located in San Antonio, steps from River Walk and 6 minutes by foot from San Antonio Majestic Theater. This 4-star hotel is 0.3 mi (0.4 km) from Henry B. Gonzalez Convention Center and 0.3 mi (0.5 km) from Alamo. Make yourself at home in one of the 265 air-conditioned rooms featuring refrigerators and LCD televisions. Your pillowtop bed comes with premium bedding. Wireless Internet access (surcharge) keeps you connected, and cable programming is available for your entertainment. Partially open bathrooms with shower/tub combinations feature designer toiletries and hair dryers. Pamper yourself with a visit to the spa, which offers massages, body treatments, and facials. You can take advantage of recreational amenities such as an outdoor pool, a spa tub, and a 24-hour fitness center. Additional amenities at this hotel include wireless Internet access (surcharge), concierge services, and wedding services. Enjoy American cuisine at Las Ramblas, a restaurant where you can enjoy drinks at the bar and dine alfresco. Or stay in and take advantage of the room service (during limited hours). Quench your thirst with your favorite drink at the poolside bar. Full breakfasts are available daily from 6:30 AM to 10:30 AM for a fee. Featured amenities include a 24-hour business center, express check-in, and express check-out. Planning an event in San Antonio? This hotel has facilities measuring 10000 square feet (929 square meters), including a conference center. This riverfront hotel is 1 block from the Henry B. Gonzales Convention Center, 2 blocks from La Villita Historic Arts Village, and 5 blocks from the Alamo. This contemporary all-suite hotel captures both historic and cultural essence of San Antonio with its warmth, created by its elegant, Mediterranean design. Guests enter an upper lobby presided over by a large portrait of a regal Contessa. From there, the 4-story atrium offers unobstructed views of the expansive Mediterranean-style lower lobby and lounge area and, beyond that, the Riverwalk. 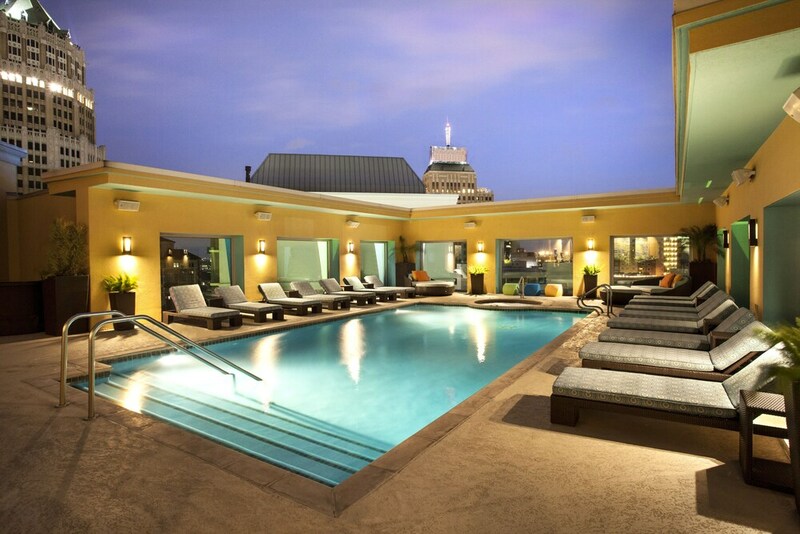 The 14-story Hotel Contessa - Riverwalk Luxury Suites offers a rooftop terrace and spa facility that provides panoramic views of the city, plus an adjacent 24-hour fitness center and a heated outdoor pool. Las Ramblas, the hotel's restaurant, serves breakfast, lunch and dinner. Dining is available indoors or out on the sun-splashed patio facing the quiet side of the Riverwalk. Guests enjoy a buffet breakfast daily (surcharge). The hotel includes luggage storage, 12 meeting rooms, technology support staff, and a 24-hour business center that is staffed on weekdays. The 2 computers with a printer and wireless Internet access are available 24 hours a day. Staff can provide tour assistance. The hotel offers 24-hour valet parking (surcharge). Self parking is available approximately 100 feet across the street, and at many nearby lots and garages (surcharge). Small pets are welcome (surcharge). Accessible features of the property include wheelchair accessible entryways with double front doors that open easily. The reception desk, concierge station, and business center all feature counter space designed to accommodate guests in wheelchairs. The spa, gym, and all meeting rooms are wheelchair accessible, and an elevator offers access to guestrooms, the restaurant, and the river walk. Las Ramblas - Local cuisine served at the our Riverwalk location. Colorful glass flowers created by local artist line the walls. Riverwalk patio with tables, most shaded by polka-dotted umbrellas. Open for breakfast, lunch, and dinner. The Cork Bar - Located on the Riverwalk level, with a variety of beer and wine. Open for lunch and dinner. Poolside bar - Open Friday and Saturday afternoons during summer. The rooftop outdoor pool is surrounded by a sundeck with lounge chairs and umbrellas. A 24-hour fitness room on the 12th floor contains flat-screen TVs, free weights, a stationary and a recumbent bicycle, two treadmills, and two elliptical cross trainers. In-room massage is available by appointment (surcharge). Golf courses are within five miles. Situated on the hotel's rooftop, the 1,700-square-foot Woodhouse Day Spa includes 4 treatment rooms and a boutique. Guests enjoy various types of massage, body wraps, aromatherapy and facial and body treatments. Spa guests can enjoy full-day access to both the fitness facility and the heated pool on the day of their treatment. Guests can order from a spa menu either poolside or at the acclaimed Las Ramblas restaurant. Reservations are required for massage services and spa treatments. Reservations can be made by contacting the hotel prior to arrival, using the contact information on the booking confirmation. The property has connecting/adjoining rooms, which are subject to availability and can be requested by contacting the property using the number on the booking confirmation. This property allows pets in specific rooms only (surcharges apply and can be found in the Fees section). Guests can request one of these rooms by contacting the property directly, using the contact information on the booking confirmation.